A List of Valuable US Rare Coins with Bullish Future. As a convenience for our coin collecting visitors, we've already searched through the value tables to bring you an introductory list of Bullish US Rare Coins. These valuable US coins have demonstrated some of the finest growth rates over a period of many years, and are likely positioned for more price advancement over the long haul. The Bullish US Rare Coins list is not all-inclusive. There are still plenty of opportunities for you to sleuth. The list does, however, provide many good examples of how to use the Coin Value Tables to find United States coin values destined for more greatness. On each individual coin listed, there is a quick blurb on why the coin made the cut, plus any other pertinent fact or opinion we think you'll find interesting. For those of us who fascinated by the historical connections represented by coins, there is also a quick section on prominent events that occurred during the year a featured coin was minted. To get to our lists of Bullish coin favorites, click any active link in the block directly below, according to the face value denomination of your choice. [Webmaster Dan Goevert speaking now...] As most readers will notice, for every bullish coin highlighted, there is a "The Year This Coin Was Minted..." lesson associated with each date. Learning about history while collecting is one of the coolest aspects of numismatics, as far as I am concerned. This website is more than a decade old now, and by now I had hoped to have many Bullish coins highlighted in this fashion. Instead, I have a bare minimum of them listed. The number of entries would have been larger, but I chose (not always voluntarily) to concentrates my resources on other endeavors related to this site, US Coin Values Advisor. If you've landed on this page seeking data on which coins have the best potential for increasing in price in the years ahead, US Coin Values Advisor is just the place for you. In addition to the "Bullish US Coins" section, turn to the Rare Coin Values Index. There, coins with long histories of extraordinary performance are tracked monthly, as a way of measuring the strength of the US coin market. 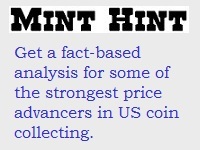 Alternatively, you can get advice on what coins to buy in the "key date analysis" for every coin in our US Coin Types section. As you might expect, there is a lot of overlap (i.e. identical coin dates) between Bullish coins, Rare Coin Values Index, and US Coin Types key date analysis. So even though there aren't a lot of coins listed in the Bullish coins section, fear not, there are other places on this site you can get the same information.